On October 1st we left Homer, our next destination Haines. 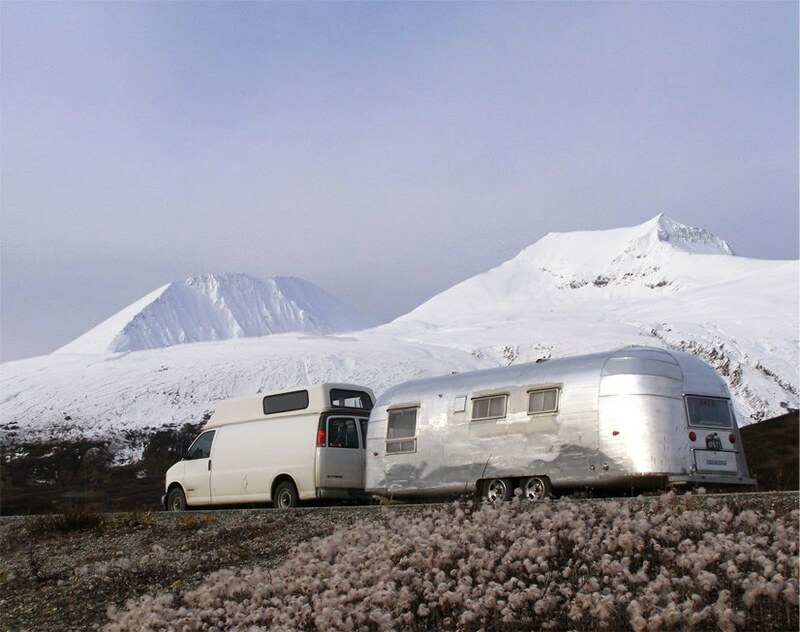 It was a 1,000 mile drive that took 2 ½ days, including a stop to change oil in the van, a job Spike did himself on a freezing cold, windy day in Tok, AK. At this point we'd driven over 5,000 miles since leaving home. 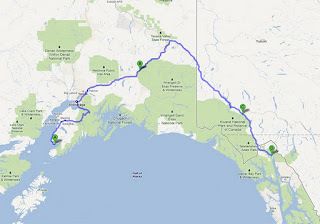 To reach Haines from Homer we had to go north, retracing our route back to Palmer, then northeast to Tok before turning south. There are no shortcuts in Alaska unless you go by aircraft or boat. B. 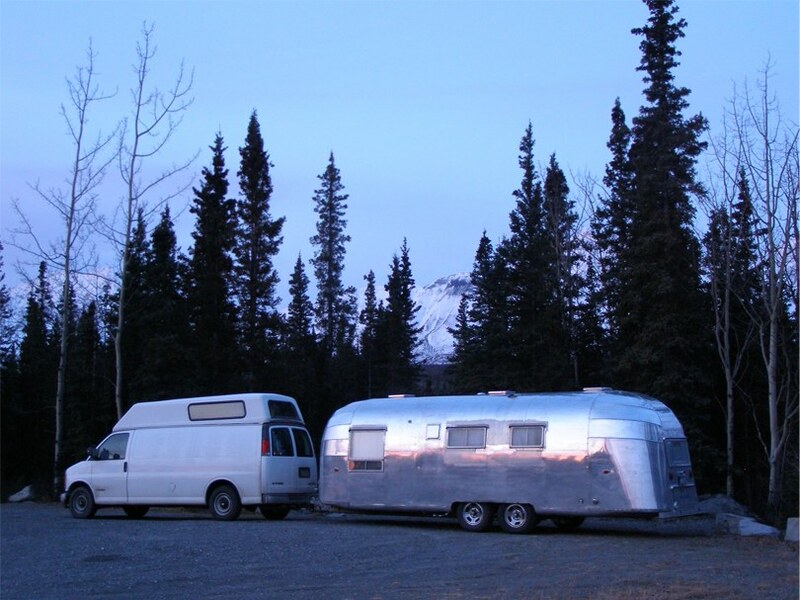 1st night in roadside pullout. C. 2nd night in roadside pullout. 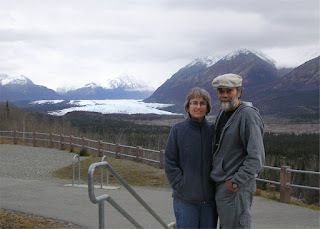 From Palmer we took the Glenn highway, a new route for us which went past Matanuska Glacier. Clouds were dark and heavy, trees were bare, we saw snow along the roadside and ponds were iced over. Winter was on our tail. 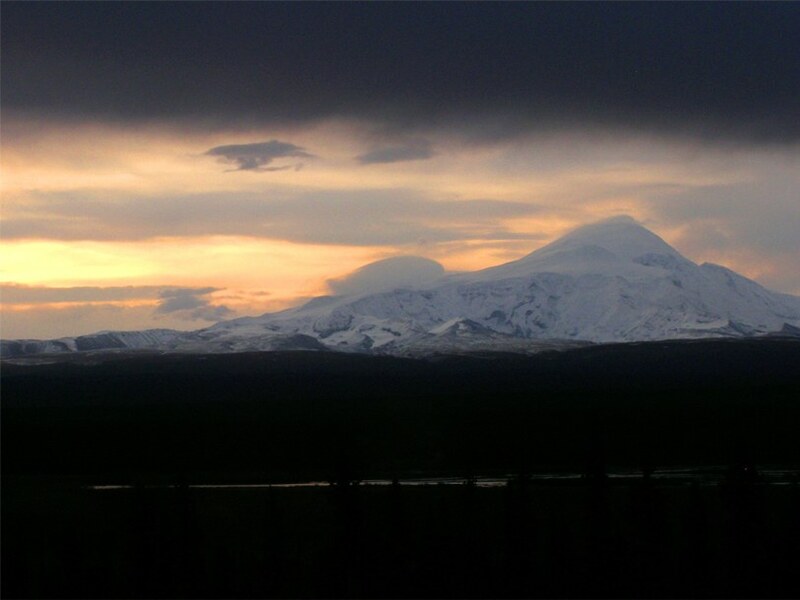 It was growing dark with no prospects for overnight stopping in sight. Thank goodness for The Milepost Alaska Travel Planner. 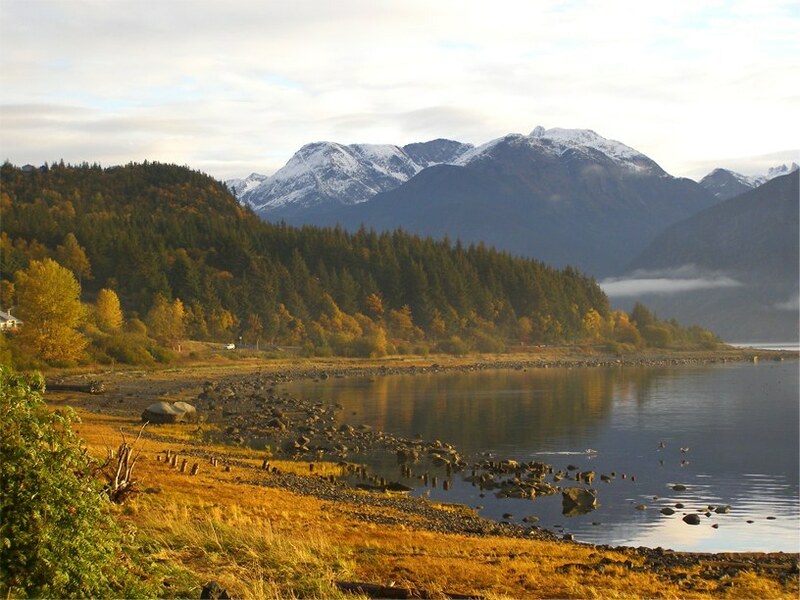 We highly recommend this publication to anyone driving to Alaska. It became our bible for this trip. 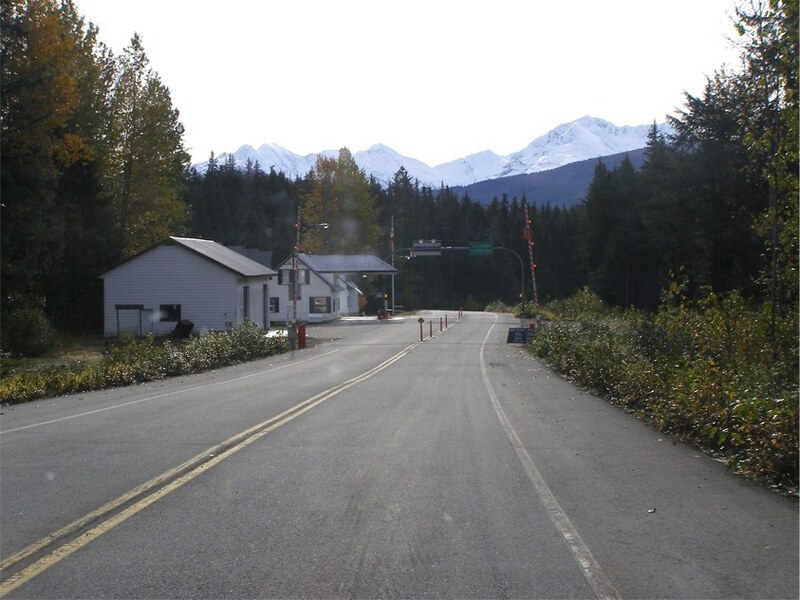 Among many other kinds of information, the Milepost informs you of every rest stop, trail head parking area, viewpoint pullout or pullouts of any kind. It gives descriptions of condition and configuration (paved or gravel, large or small, double-ended, etc.) and exact location by mile-marker reference and which side of the road. Even after dark we could find overnight stopping places with Milepost guidance. 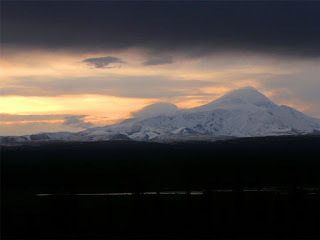 On the road early the next morning we see sunrise on a snowy mountain. As we crested a 2,000 ft. summit we were at snow-line. 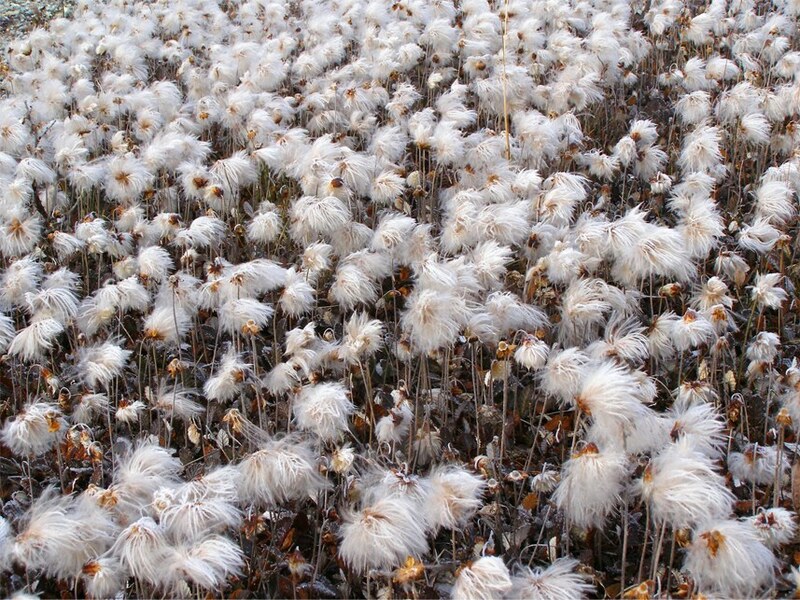 Here and there we saw fields of cotton flowers looking like snow banks. 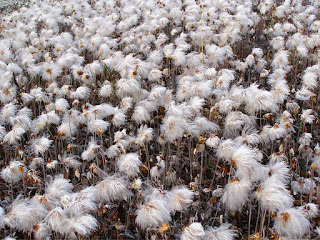 A field of cotton flowers. To reach Haines from Homer required two border crossings, first a return to Canada's Yukon Territory. 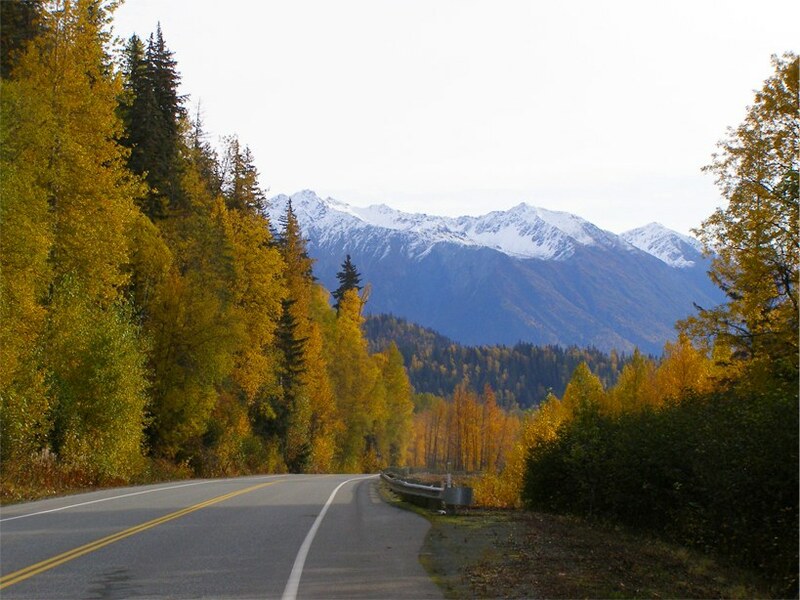 We re-traced part of the Alaska Hwy as far as Haines Jct. This was the worst stretch of the Al-Can where cracks, pot-holes and frost heaves forced us to slow to 35mph. 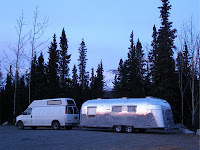 It was a bucking bronco ride for many miles, very rough on our 56 year old Moonshadow but she held up well. 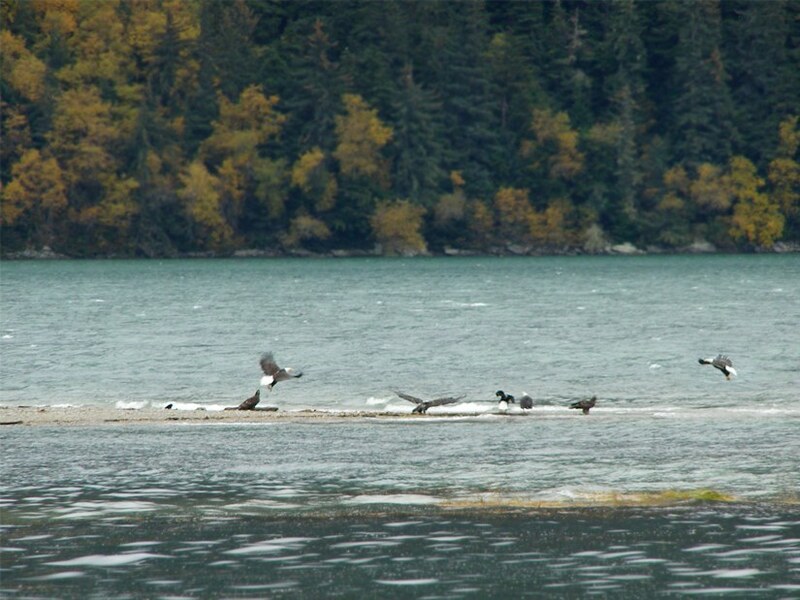 Our second crossing was back into Alaska 40 miles north of Haines. The further south we go, the more we return to warmer weather and autumn colors. 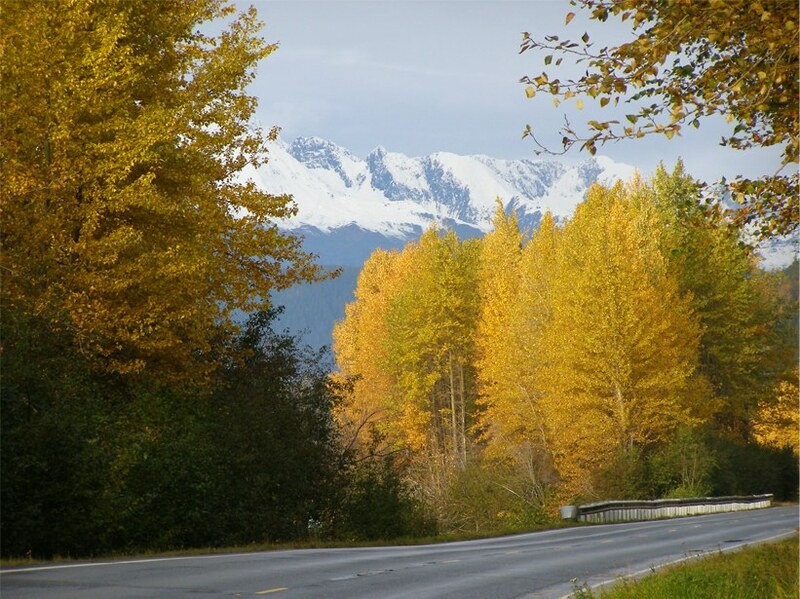 This lifts our spirits greatly, more sun, more brilliant colors, more beautiful Alaska. 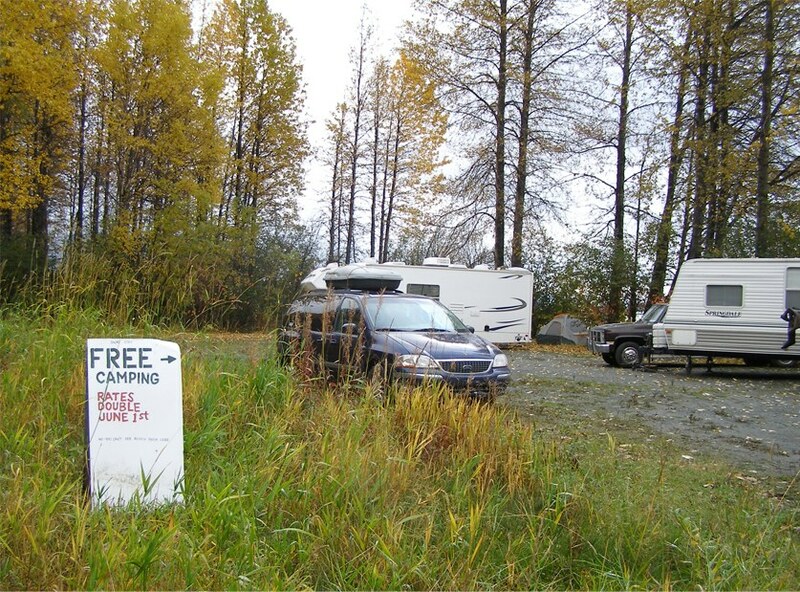 One thing we learned about Alaska is that in Alaska the law allows travelers to camp anywhere on public lands they can find a space to park. 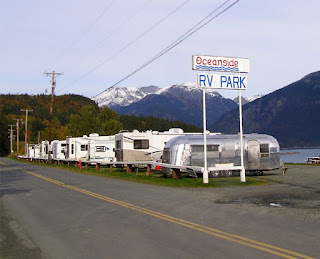 As we neared Haines roadside spaces were full of campers. 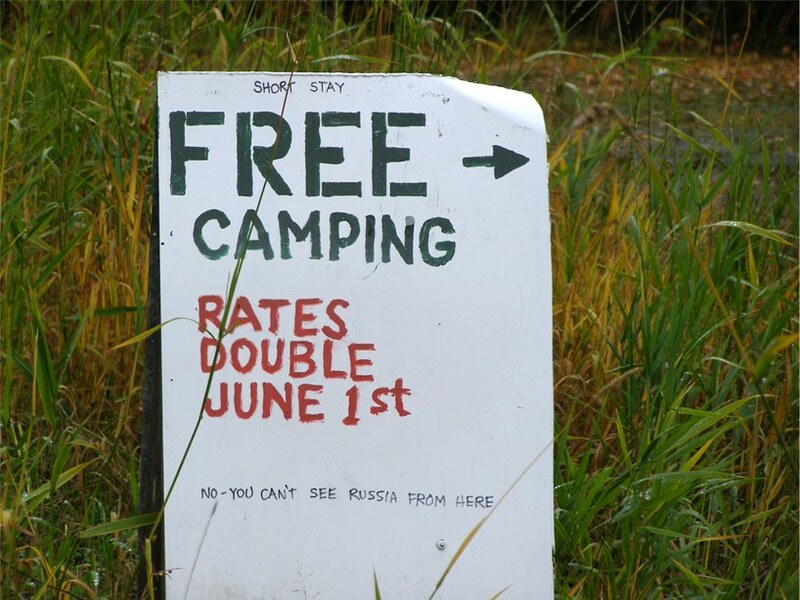 Here we spotted a little Alaskan humor. The Haines Hwy follows the Chilkat River where a late season coho and chum salmon spawn was taking place. Fishermen were numerous. 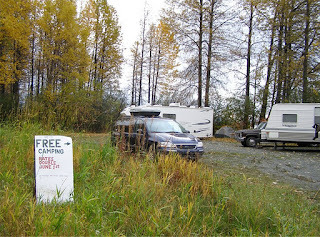 This explained the large population of campers in October. 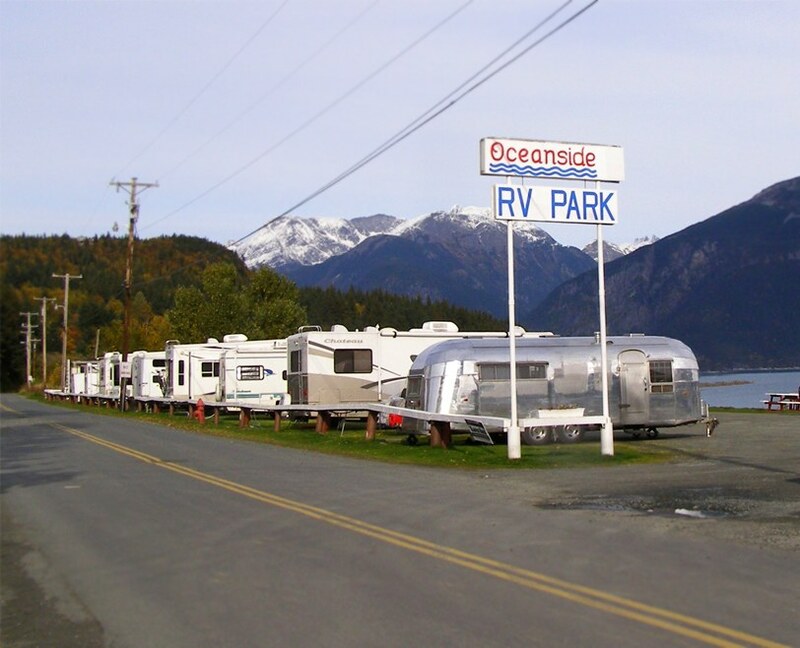 The only full-service Haines RV park still open in October was Oceanside RV Park, located on Portage Cove off the Chilkoot Inlet. Moonshadow shines like a lone star in a field of white boxes. We soon learned the coming weekend was Canadian Thanksgiving. 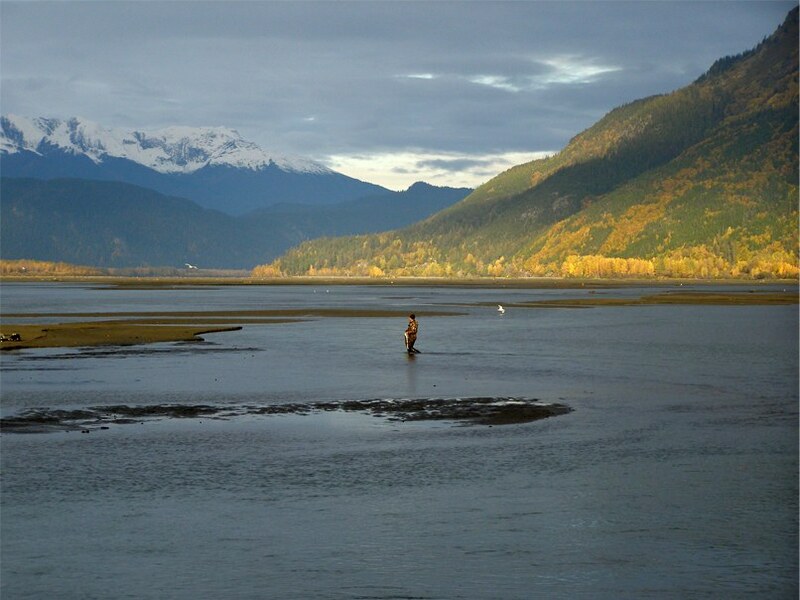 Haines would be further inundated with Canadian campers toting fishing gear. We decided to stay put through the holiday. 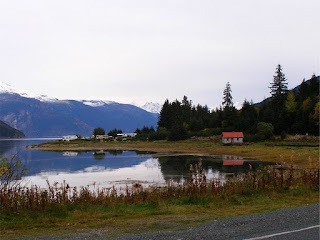 This made our stay in Haines seven days. 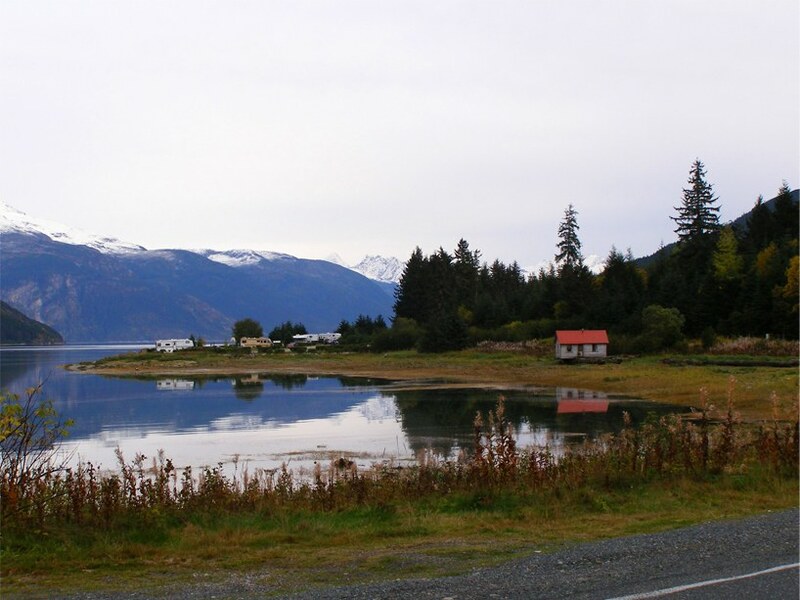 Next morning's view of Portage Cove from the RV park. 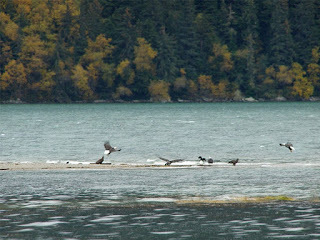 The Haines area is noted as a location for massive congregations of bald eagles in the winter. 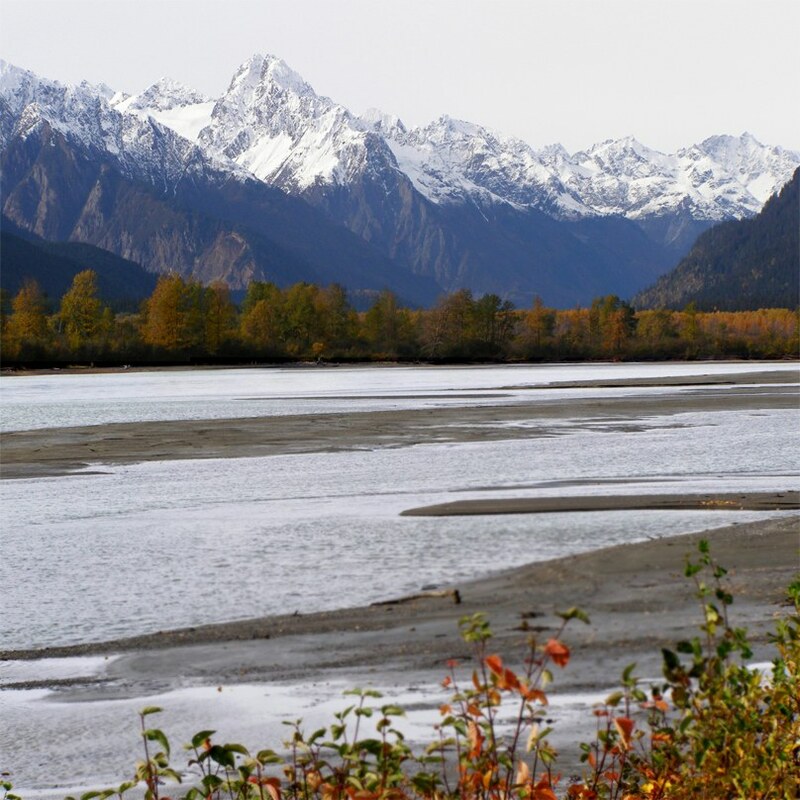 As many as 3,500 have been counted along the Chilkat River between mid-October and January. Unfortunately we were a week too early. 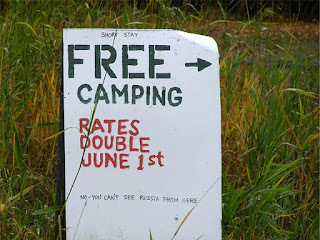 We saw only a few clusters here and there on gravel bars. Another beautiful scene along the Chilkoot Inlet that may become a painting. Painted looking east from Oceanside RV park. 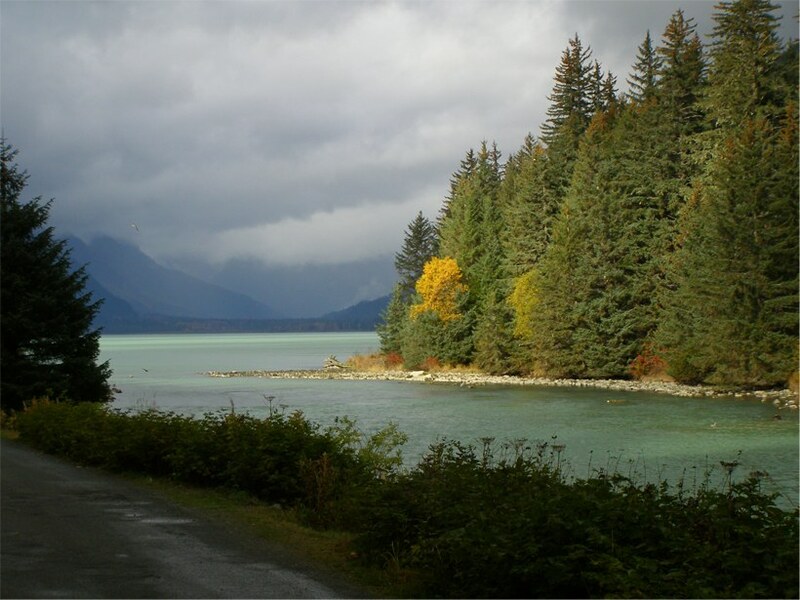 On approach to Chilkoot Lake. 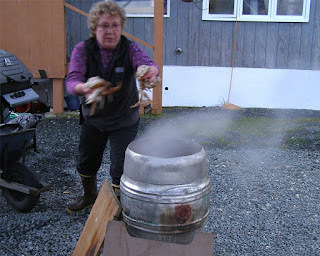 The Oceanside RV park owners love to host crab boils for their guests. At $6 per crab we pitched in for two. These were the fresh catch of the day. Once crabs were boiled and ready to eat, the RV park residents gathered together, each contributing a potluck item to the feast. 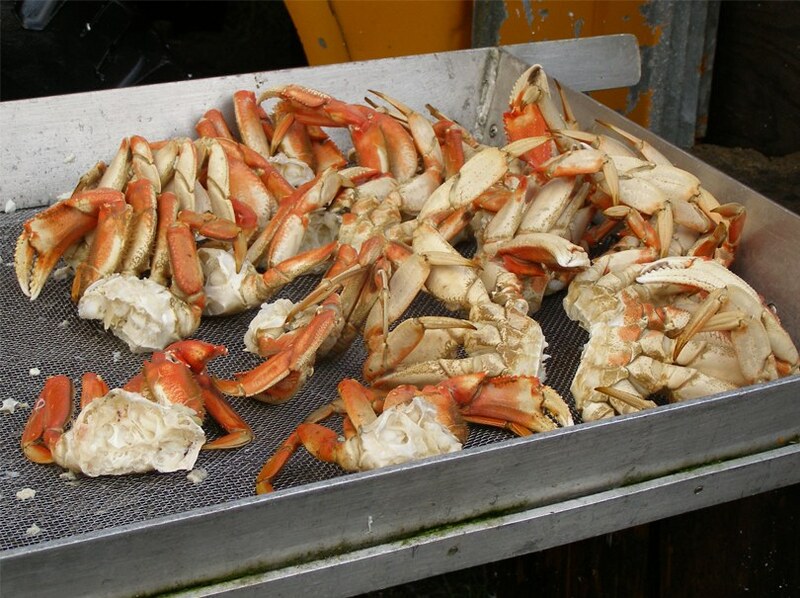 We cracked crabs, talked and ate for hours. 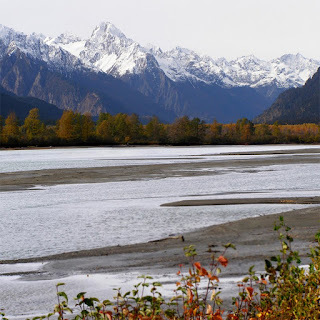 Majestic mountains along the Chilkat River north of Haines. Painted looking south from Oceanside RV park. 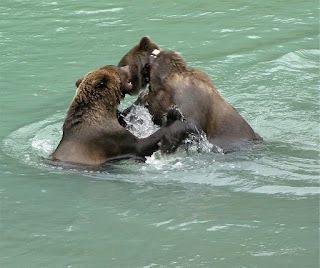 Our first Alaska sighting of Brown Bears, aka, Grizzlies. 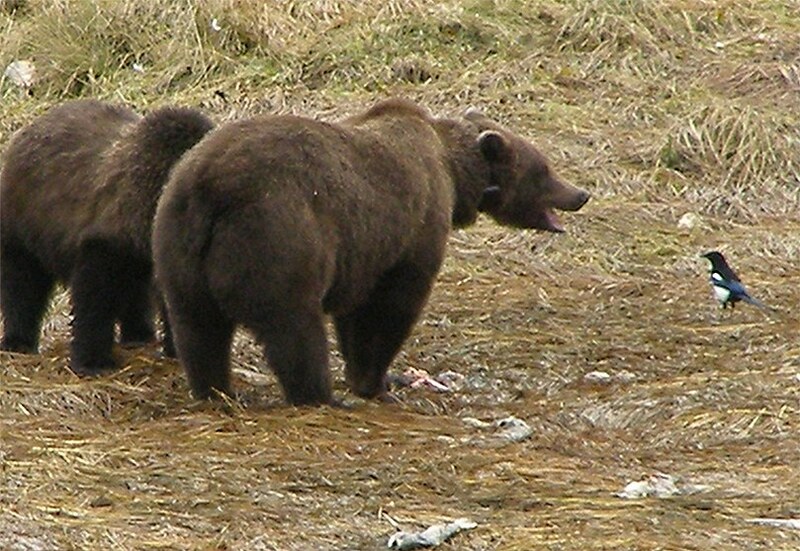 This is a mother bear who has two nearly full-grown cubs. We saw the mother and cubs everyday frequenting the Chilkoot Lake area. We could see she wore a tracking device and all three bears had ear tags. They were too busy catching fish and playing in the water to pay much attention to gawkers on the banks. Nevertheless, caution is always the rule. 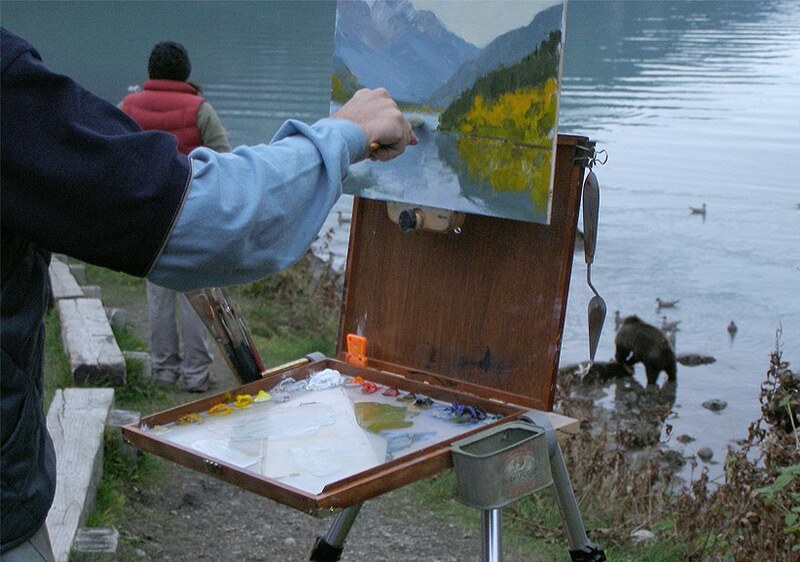 Spike painting at Chilkoot Lake while grizzlies fish and frolic in the water below. 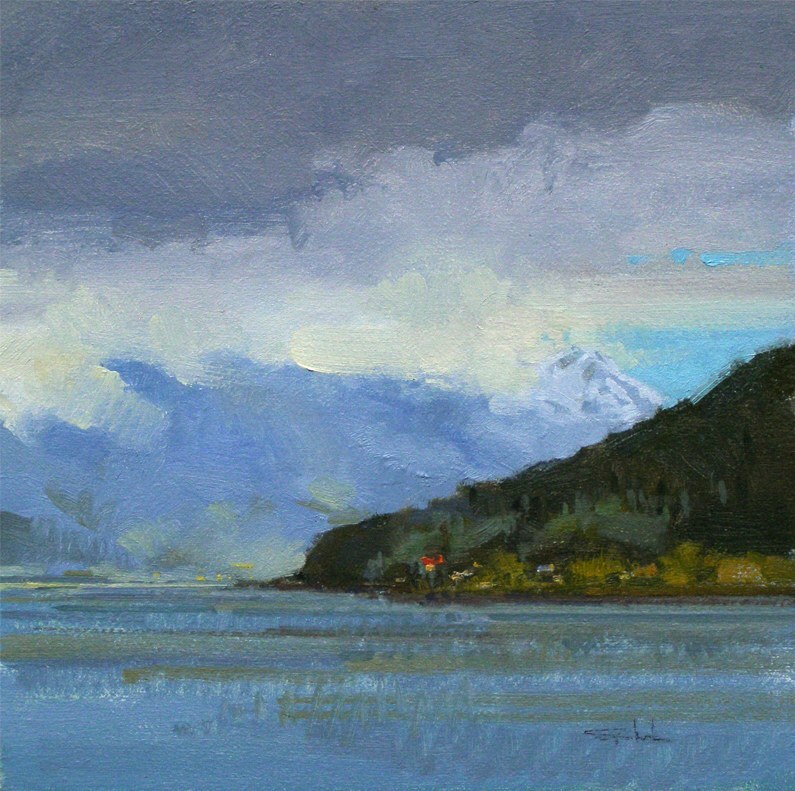 Chilkoot Lake on a misty afternoon. Our time in Haines included sunny, rainy and misty days. 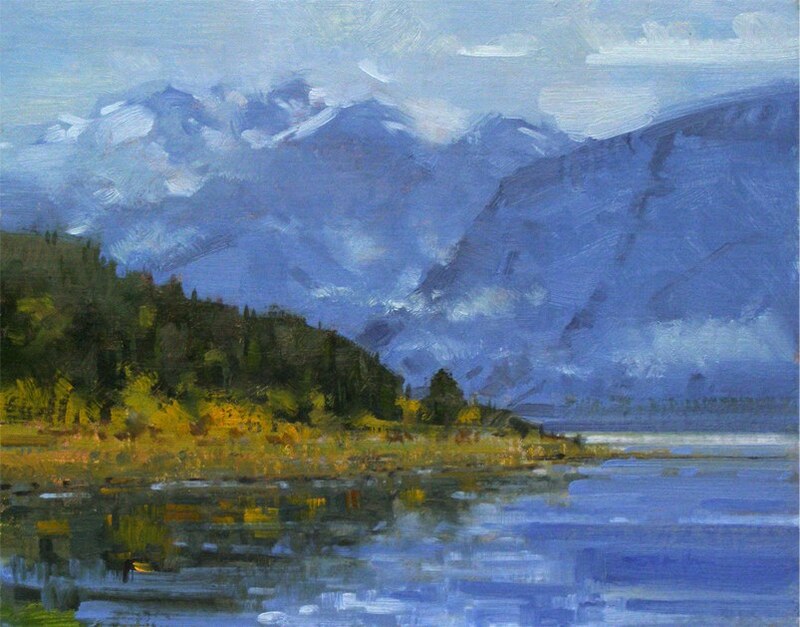 Spike especially liked the Chilkoot Lake scenes. 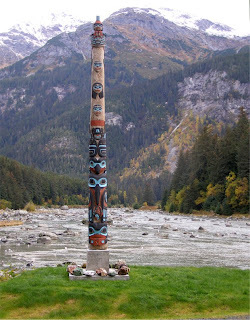 Riverside Totem pole. There were several beautiful, newly carved totem poles in the Haines area. 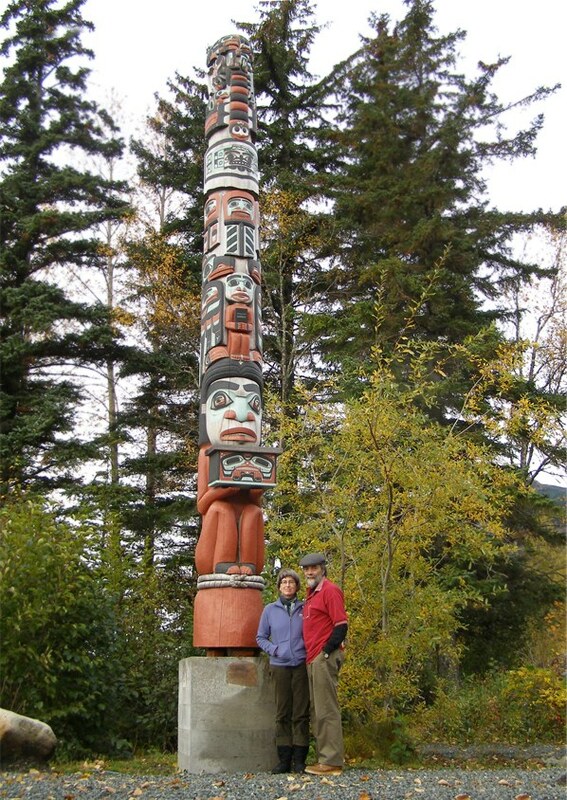 We heard one could get a “totem pole tour” guide at the visitor center but we could never catch them when open. 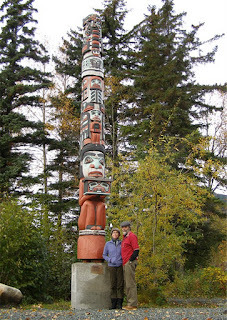 Haines Borough Public Library Totem pole. This one was carved in 2009 by designer/carver Jim Heaton along with three Klukwan carvers and three teenage apprentices. It was designed specifically for the library. All the symbolism pertains to the library's history and purpose in the community. 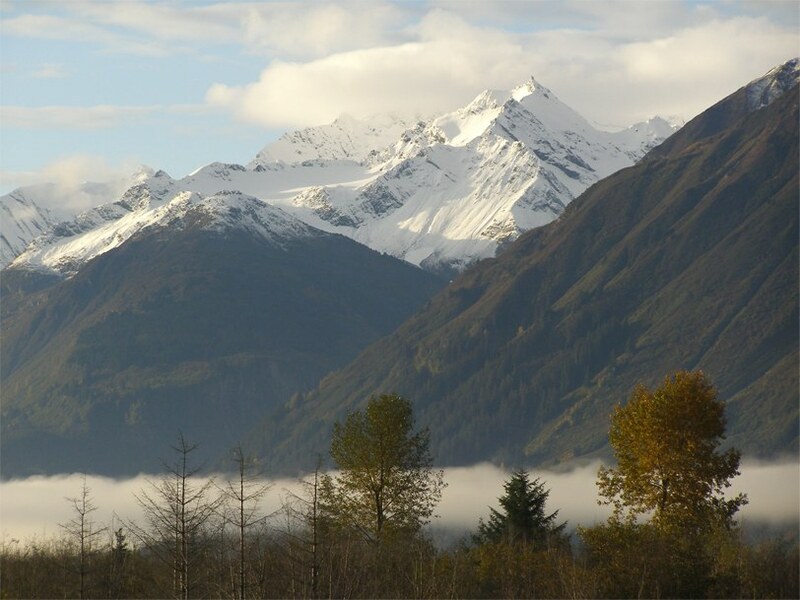 Beautiful mountain view in Haines on our last day. 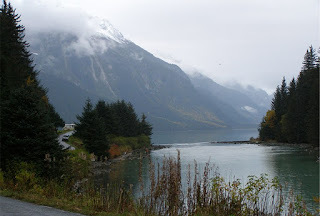 We prepare to take the ferry to Skagway for the next leg of our journey. Beautiful post! You just amaze me, where most travelers pull out a digital camera, you whip out your oils and paint stunning pieces of art. ps- should you decide to paint 'Chikloot Inlet' be sure to replace the white boxes with Airstreams! Safe travels to you and Sue. October seems like late in the year, but maybe the salmon fishing makes a late trip the right idea. Maybe a lot less traffic, what with school starting? Hope so. This makes me want to get the Safari finished ASAP and head up, probably not in 2012, but maybe 2013--with the kayaks, of course. Nex trip through Utah I hope you're home and I can get more details!